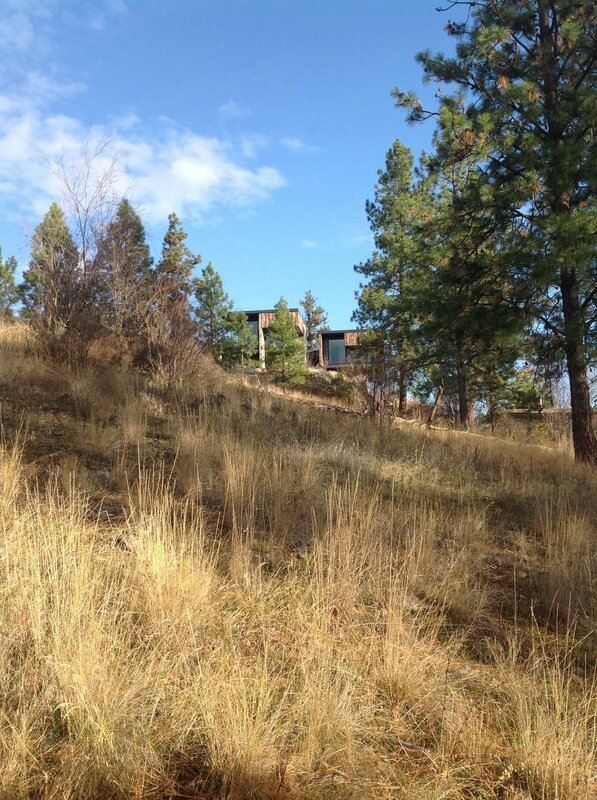 The Friesen Wong House is situated on a rocky knoll, at the edge of a non-descript cul-de-sac amid the treed and free flowing topography of the Kalamalka Lake Provincial Park. Provoked by a rich history of cattle rustling and gold prospecting, a composition of burned fir planks, raw concrete blocks and steel sheets create a conglomeration of rooms unified under a planar roof. In contrast with the ubiquitous attached garage of the surrounding suburban houses, this house's living areas and carport are pulled apart to create a void that becomes a spacious natural courtyard. The house's implied area is 3 times greater than the heated interior space, creating an expansive domestic compound with limited means. The continuous cantilevered floor slab contrasts with a rocky ground plane that undulates below, creating sectional diversity and a rich variety of interior experiences. Inside, circulation is carefully choreographed. The sequence of travelling through the spaces is amplified by varying degrees of exposure to daylight ranging from blue northern light to orange western light. The planning is simple, with the living areas, master suite and children's bedroom all occupying distinct zones within the house. A pottery studio and shop above the carport further enhance the sense of distance between dissimilar functions. Summarizing a dual relationship to the rocky site, a cantilevered terrace is at one moment level with the existing rock and then, a few steps away, soaring 14'-0" above it. Chunky saddlebags attached to the exterior walls of the living room, master bedroom and master bathroom are actually storage cabinets that in turn shade 5'-0" high windows underneath, visors well suited to enjoying the views when lying down or seated. Deep eaves at the south and west elevations protect the interior from hot summer sun, in a region where temperatures regularly reach 40°. Exaggerated fin walls create shade and cut interior glare. Only the custom designed dining table receives a full force of morning light with no overhang at its window - a cheerful beam of Vitamin D for breakfast. At the windows surrounding the house's courtyard, maneuverable fir planks slide on galvanized metal pipes, enabling the client to endlessly sculpt the shade and light patterns during different seasons. This project utilizes the most progressive cantilevered concrete and structural insulated panel building technology (SIPS), without allowing these elements to over-determine the architecture. The quotidian qualities of the house create its personality and soul. SIPS panel's OSB faces were left exposed in the interior circulation spaces, while the lowly Sonotube concrete column that supports the outdoor terrace fulfills a greater potential, hollowed out to become an outdoor fire pit.